It’s a New Year, which means it’s time to reflect - both on the good and on the bad. If your content strategy is letting you down - as in, it’s not getting you the conversions you want or the sales you need to keep your business afloat - then it’s time to do something about it. There’s no time like the present, especially with the fresh start of a New Year to kick you into action. But before we dive into how you can fix your underperforming content strategy, it’s vital that you know why it’s failing in the first place. This could be down to a number of reasons, whether it’s the fact you’re not measuring results, have your audience all wrong, or simply because you’re not putting enough time and effort in. Look at it this way: when asked how effective their content strategy is compared to a year ago, only 24% of marketers said “much more effective”. The majority answered “somewhat more effective” or “about the same as one year ago”. Which, when you consider that most marketers aren’t happy with how their content marketing strategy is performing, means that they still aren’t happy with the results. Time for a big switch up, right? I’m going to run this post a bit differently. I’ll assume that you have your audience down to a T and know exactly what they want from you, and you have everything set up to create a content strategy, like branding guidelines and a fully-functional website. I’m also going to assume that the biggest struggles marketers face with their content strategy are the same reasons they’re failing. In the graph above, you’ll see the top eight biggest challenges content strategies present for marketers, and I’m going to unpick the top four one by one. The biggest problem arises when it comes to measuring the effectiveness of a content strategy. A lot of marketers know that they need a strategy, but they’re not sure what results they need to measure or even where to look to measure those said results. Before you even start to measure how your content strategy is performing, you need to know what exactly you want to measure. For this, you need a set of solid goals in place that you can keep coming back to. Once you have a solid goal in mind, you can create your content strategy around that, so that everything you do ties into it nicely. Plus, you have something to measure. If you’re not getting 500 more people onto your email list each month, you know that something needs to change; likewise if you’re struggling to get 10 comments on each new blog post. Engaging content seems to be the buzzword of the moment, but it’s so important if you want to build a loyal following of fans and customers. Engaging content is content that’s compelling, that your audience actively interact with, and that, most importantly, drives them to take action. If you identify with any of these, don’t fear! You can easily turn this one around. In three quick steps you can have a slew of creative and engaging content ideas to start working with right away. Step #1: Really get to know your audience. Dig into forums where they hang out and note down common questions that are asked. You can send out a survey too, to find out what key challenges your audience face within your industry. Step #2: Create content that answers these key questions and taps into the major challenges your audience face. Your aim is to provide a solution to their problems - that’s what makes engaging content. I’m going to call you out on this one. Sure, it might seem like you need a millionaire’s wallet to take your content strategy to the top, but that is so far from the truth it hurts. Could investing in a content creator actually make you more money? In the beginning, it might seem like an unnecessary expense, but by hiring an expert content creator, you’re more likely to create content that attracts and converts your audience and, therefore, will make your more sales. Companies with active, consistent blogs generate 67% more leads than those that don’t. Hiring a content creator doesn’t seem like such a bad idea now, does it? Could you repurpose the content you do have? Okay, if hiring someone is way out of the question (even if it does mean growing your business twice as quickly), you might want to repurpose the content you already have. You’ve probably got tons of juicy information and advice lying around in your web copy, on social media, and in documents you’ve written up, and you can easily turn these into engaging content. For example, you might turn a client case study into a video, or create a blog post that highlights who you are and why you started your business. 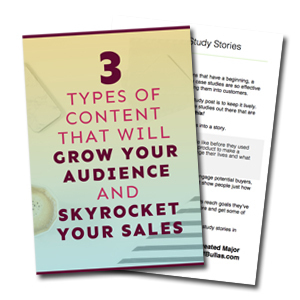 Are you ready to use your content to attract and convert more customers or users? ​Grab your free guide below! One of the hardest things about creating a successful content strategy is keeping it consistent. It’s particularly difficult when you’re struggling to see results to keep persevering, but that’s exactly what you need to do if you want it to work for you. It’s not enough to publish a short blog post now and again. It’s not even enough to publish a blog post every two weeks if you don’t have a purpose for them. If you’re doing it for the sake of it, then there’s no point doing it at all. Creating a scheduling isn’t just about picking dates to publish content on; it’s about choosing what topics to focus on and when, and thinking about your sales funnel in its entirety. If that’s something you’re finding difficult to get a grasp on, I’ve got just the thing for you. Create Electric Content gives you the tools and materials you need to create a simple but incredibly effective content strategy that will help you increase your leads and make more sales. If that’s not your goal for 2018, then what is?! Find out more about the program here and consider joining us if you’re ready to stop seeing your content strategy fail and start seeing it soar.